Strawberries on a strand of garland is sure to start a craving. 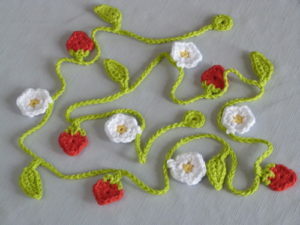 This time I have taken the lovely spring theme of strawberries and added a few similar elements, leaves and blossoms. 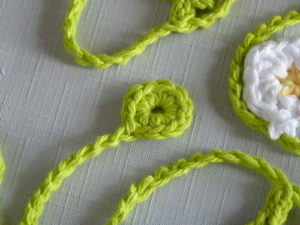 Each piece is made in one or two rounds with basic crochet techniques and then attached to the garland strand. I chose cotton yarn for my garland to give it a more natural feeling, and because I like the defined look of cotton, but other fibers will work just as well. The garland is designed to have small rings at both ends to allow for easy hanging. This garland is light and airy and will make a good compliment to any room for extra spring feeling. Hanging it from an entertainment center or mantle will surely brighten up a living room, as well as garner some attention for your handiwork. Enjoy crocheting this lovely, new pattern! And don’t be surprised if you suddenly begin craving fresh strawberries! With color A, join in 12th st on Round 1, ch 2, sl st in next st, ch 2, sl st in garland, sl st in next 2 ch and same st in Round 1, ch 2, sl st in next st.
Make garland strand first. 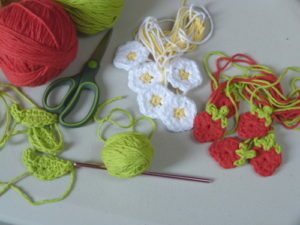 Use 15 stitch markers to represent the position of the strawberries, blossoms, and leaves. 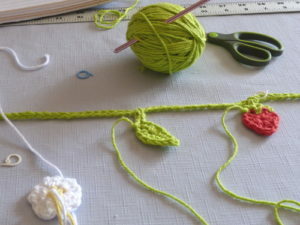 Attach elements as you go or make each one with a long tail for attaching later. Have fun, and be sure to let me know if you have any questions with the pattern or need any help crocheting! This entry was posted on Thursday, June 1st, 2017 at 10:02 AM by Amy	and is filed under Free Crochet Patterns. You can follow any responses to this entry through the RSS 2.0 feed. You can skip to the end and leave a response. Pinging is currently not allowed. I’m confused by the stem instructions. Specifically where it states “sl st in garland, sl st in next 2 ch and same st in round 1”. Are the 2 slip stitches made in the next two stitches on the garland? And what does “same stitch in round 1 mean”? And is the last sl st on the strawberry? Thanks much for your assistance. 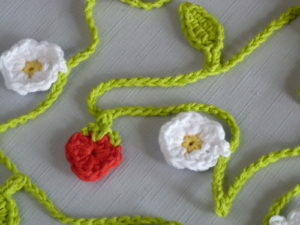 You are going to attach the strawberry to the garland (ch 2, sl st in garland), and then continue working in the stem of the berry, making the last stitch in the same stitch as the the one that you started the stem in (sl st in next 2 ch and same st in Round 1). And lastly, finish off the berry stem by doing the same thing to this end as the first end (ch 2, sl st in next st).